Let me start by saying that I have way more experience dealing with tantrums than I care to admit. My precious two-year-old has inherited some serious anger issues and occasionally (okay, often) will throw an all-out tantrum such as the world has never seen. I’m talking the writhing & screaming on the grocery store floor type tantrums. On one hand, I feel like I’m an expert on tantrums because my husband and I have had to deal with so many. On the other hand, I feel like I have SO MUCH to learn about them because we have so far to go. I have, however, learned a few techniques that have helped us tremendously and that maybe (just maybe) will help you, too. Count to 10. No, I don’t mean the old “You’d better come here before I get to 10” routine (which, in my not-so-humble opinion, does little to prevent the inevitable & ends up just teaching a child he doesn’t have to obey until you get to 9). No, this is a tip I learned from this post here, & it worked wonders for us. The point is to give the child notice that something will happen soon. But if you say “we’re leaving in 2 minutes,” a toddler has no idea what that means. By saying “I’m going to count to 10” it helps them better understand how much time they have left. And the beauty is that you can count as quickly or as slowly as you’d like. Don’t expect this to work 100% of the time, but it really did work miraculously about 9 times out of 10. Bonus tip: I’ve also found that explaining to kids what’s going to happen (& what’s expected of them) ahead of time is also SUPER helpful in preventing meltdowns. So you say something like, “Okay, we’re going to play a game. I’m going to tell you to do something & you’ll respond with ‘Yes I will’ then you’ll go do it!” Then you proceed to ask him to do something easy like “go sit on the couch” & run and do it with him. Throw in lots of cheering & clapping and excitement as they obey. Scenarios like this happened all the time at my house until I recently had a bit of an epiphany. Wait a minute! I’m telling him to do something, he says “No, I want to do something else,” and I say “sure.” I am basically teaching him that if he doesn’t like what I tell him he can just say no and he won’t have to do it. No wonder he gets upset and doesn’t obey when it’s something I really do care about. So I thought about it for awhile – I really don’t want to insist he play with the boat…..But what if I started insisting he obey first then ask for something else. Me: Obey first, then ask for something else. Pick up your boat. Clayton goes and gets the boat. Me: Okay, now you can ask for something else. Clayton: Play with car, please. Now at first this took a lot of effort on my part. I really had to work with him to get him to obey first, but it’s only been a week or so and he’s already getting the idea. And it’s starting to help him be used to obeying when I ask him to do something I really do need him to do. Tell teaching stories. I recently started telling Clayton stories about a boy named Alex whose live experiences are surprisingly similar to his own. In one story Alex learns to obey and not scream. In another, he learns that it’s good to eat his dinner. Or to play nicely with his little sister. Clayton LOVES “Alex stories” and I can see the wheels turning in his head about the parallels. At the worst, it sure can’t hurt. And I think it just might be helping. Of course we could also talk about being consistent, having consequences, and addressing problems while they’re small – all super important, but you probably already know that. I just wanted to share a few unique ideas that have been helping us lately in hopes one or more may resonate with you. So just keep at it, brave mama. Keep working, brave teacher. Our work is not in vain. So our track record was pretty up and down until I was talking with one of my friends about anger in kids. I suddenly realized I had been dealing with the results of the anger & trying to get him to handle it correctly, but the real problem was the anger itself, not just what he did with it. So…..
#5: Teach them to get the anger out of their heart. I sat with my son and talked with him about how anger gets in your heart & how it makes you scream and throw fits. I taught him that when he gets upset he needs to tell the anger to get out of his heart. We said it out loud, “Get out, anger!” For the next few days, every time he got angry, we talked about getting the anger out of his heart & he’d tell it to get out. The change was immediate and astonishing. Normally it calmed him down immediately. When it didn’t, we’d pray and ask Jesus to help him get it out. I can’t even believe how much this one thing has changed things. The other tips are great, but this has made the single biggest difference. It’s been a few months now and I actually can’t remember the last time I had to remind him to get the anger out of his heart. It still happens, but it’s more of an occasional thing than a constant. I’d totally recommend you try this. And think about how it applies to other situations too. I’m now trying to think about what the root problem is and deal with that first before I try to deal with the external results of the problem. 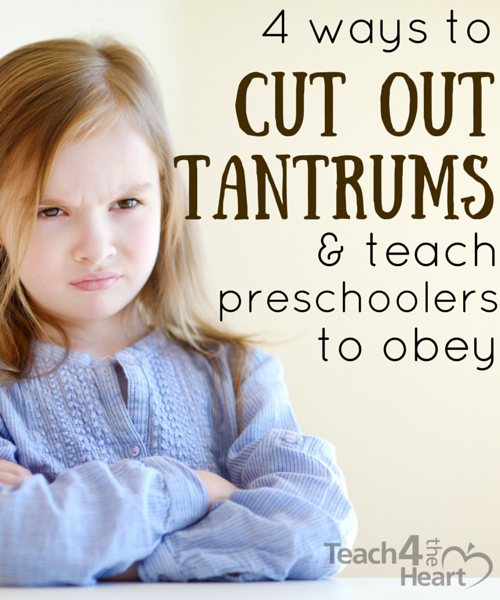 What advice do you have for parents or teachers who are working to teach preschoolers how to obey? We’d all love to hear it!! If I as students to make the letter “o” with their play dough, for example, and they are not all doing it, then I take pictures of the ones who are, and praise them, and soon everyone is making o’s because they want their picture taken. Then I can use the pictures to know who has the skill and who needs more practice. I luv these tips abd the example video. Is it possible to show the Alex story..You see my little girl is 2 and having a hard time..I have an older child whonis autistic and a younfer sister who only 1year old.. I definitely needed to read #3! I recently had this epiphany as well and wasn’t really sure how to fix it. First off, I’ve dealt with the 3 year old public tantrum while having an infant as well. I always try to drop whatever we are doing and leave. But simply leaving is definitely harder now with two little ones. I am 5’3’’ and have had to carry a kicking and screaming 40 lb child on my hip with a car seat in the other hand on a few different occasions. It’s a relief to see I am not the only one who has been there. Also, I’ve read a lot of different words of advice on dealing with toddler tantrums and most just make the situation worse and DEFINITELY don’t work in stressful public situations (time outs, ignoring them, etc). When he’s out of control like that, he gets scared and doesn’t know how to calm down on his own.. I try telling him to breathe and count to ten and then tell him I love him and sometimes that works but not always. I love your “golden tip” idea so much and am going to be trying this. Lord knows I need prayer to stay calm when I’m dealing with these situations and I feel like my little one does as well. So thank you so much for that idea. Your tips are great advices. Thanks for sharing. What wonderful tips! I can’t wait to try them. Thank you for sharing. Thank you for these tips! My little guy will be 4 next month and has been throwing big fits! He gets mad easily and will not listen . He absolutely hates wearing clothes! When we get ready for church in the morning he cries for an hour and says he wants to stay home and refuses to get dressed ! It’s been such a challenge! I feel then I get mad and start yelling , I can’t seem to calm down . It’s definitely a learning process but I’m starting to read and get advice . I just want to walk in love & have patience and be the mom God has called me to be….. Picking up their toys used to be a challenging for all of us. One day I actually move the toys out on top of the recycling bin. I explained why I did that. So the next day When I asked to put the toys away they know what’s going to happen if they don’t. I know it sounded like I’m a mean person but I wanted them to learn to put them away after playing. Also, I invested on clear bins that comes with lids (got them At Walmart) my husband sat with them and showed them where each toys should go. We have large bins for large toys and a basket for medium and the small actions toys in small bins. Now my family room looks much better!! !